Nothing brings a community together like a park and there are few parks like the one in Southeast Ocala. No matter what type of activity you are looking for this parks seems to have it available. 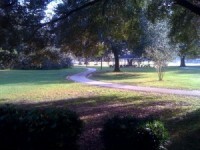 Jervey Gantt Park, named for a former Ocala Parks and Rec director, is located on SE 36th Ave. It is a magnificent 60 acre sport complex featuring a 2 mile jogging track, an aquatic center, tennis courts, racquetball courts, sand volleyball courts, basketball courts a football field, dog park, a playground and a new memorial garden. The 2 mile jogging track meanders through sunny, shaded and wooded areas offering occasional exercise stations to give your workout a little boost. A new 5 acre memorial garden with tranquil walking path, butterfly gardens, bird houses and a waterfall greets you at the top of the jogging trail. Bring your four legged friend to the Millennium Dog Park to enjoy the outdoors too or have a picnic in one of the many covered pavilions.Feel free to relax on the lush grassy areas throughout the park. This park is a great place to gather, meet new friends, exercise or relax. Now that the weather is cooling off, there is no excuse not to check out this fantastic park in the heart of Ocala. There is plenty of parking on all sides of the park but what makes this park so wonderful is it’s proximity to many Ocala neighborhoods. You can walk or bike from Crestwood, Crestwood Villas, The Magnolias, Woodfields, Highlands and others.